Hyderabad, April 7: Debutant Alzarri Joseph, who recorded the best bowling figures in the Indian Premier League's (IPL) history, said he could not have asked for a better start. "It's unbelievable. It's a dream start. I don't think it could get any better," Joseph told his captain Rohit Sharma in an interview for iplt20.com after helping the Mumbai Indians beat fellow pre-tournament favourites the Sunrisers Hyderabad (SRH) by 40-runs on Saturday night here. Joseph (6/12), the 22-year-old Caribbean, not only helped the Mumbai Indians win, but he also rewrote the record books by surpassing Sohail Tanveer's 6/14 in the inaugural edition. Joseph replaced veteran Lasith Malinga in the side. He said the moment he got to know that he will be making his debut, he just wanted it to give his all to the team. "I just wanted to go out and put all my effort into this team," the Caribbean pacer who replaced veteran Lasith Malinga in the playing eleven, told media after the victory. 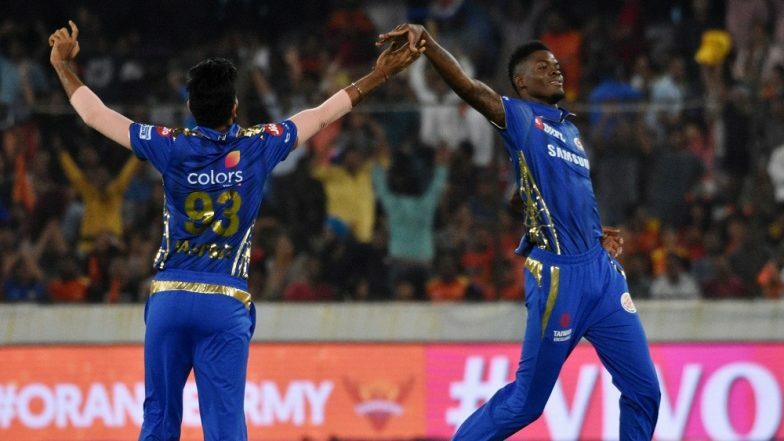 Best Bowling Figures in IPL: Alzarri Joseph Breaks Sohail Tanvir’s Record, Scalps 6/12 During Sunrisers Hyderabad vs Mumbai Indians VIVO IPL 2019 Match. "It was my first game, I just wanted to get out there on the park and get bowling and get the wickets." Joseph bowled in-form David Warner off an inside edge with his very first delivery in the league to get off to a dream start. He then went on to remove India all-rounder Vijay Shankar in his following over, the seventh of SRH's innings, before returning in the death overs to add four more to his kitty in a record-shattering debut. "I don't really celebrate wickets, I celebrate wins. My aim isn't just to get wickets, but to win the game for my team," Joseph said. Traditional slow starters Mumbai rode his salvo to script their third win by successfully defending 136 against the in-form Sunrisers batting line-up on a sticky wicket.